This convenient tabletop appliance caddy is designed to hold and organize blow dryers, heat irons, straightening irons, curling irons, hot combs and other accessories. Both space saving and portable, it can be moved wherever needed throughout your salon, or brought to client meetings to create a professional workspace. A 2-5/8" (Dia) ring allows you to quickly stow and retrieve your blow dryer, including those fitted with nozzles or other attachments. It can also fit and store almost any flat or round hair iron, and includes two rectangular storage compartments measuring 3-1/4" (L) x 1-1/8" (W) x 2-7/8" (D), both with a rounded area extending the width to 1-3/8". Three additional storage tubes each measure 1-1/4", 1-1/8", and 7/8" (Dia) x 2-7/8" (D). 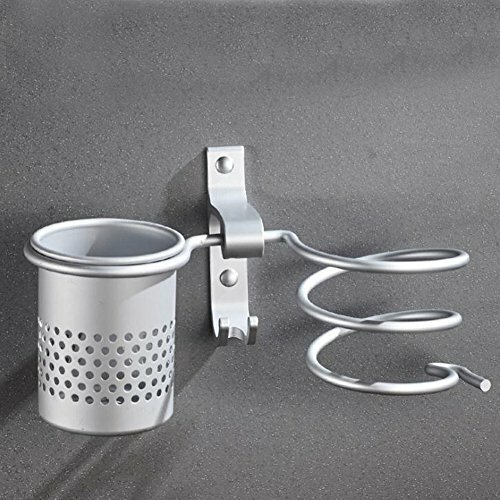 This appliance holder is extremely durable; constructed from high-grade steel in a heat resistant hammered finish, it is extremely attractive and will last for years and years. Additionally, each storage compartment is made of tough jet-black composite. 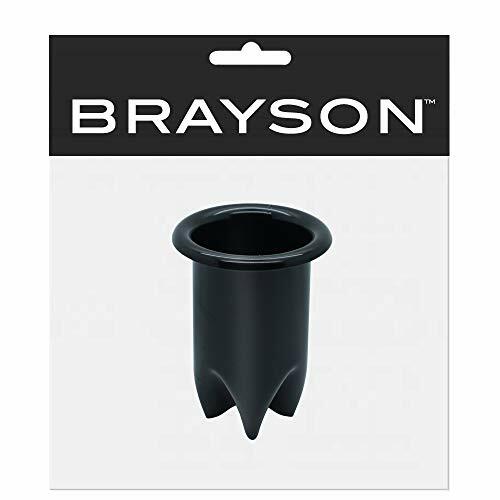 A sturdy base measuring 9-7/8" x 5-1/8" with anti-slip foam feet easily keeps this stand steady to support your appliances and tools, and there are two screw holes in the base for a more permanent installation. 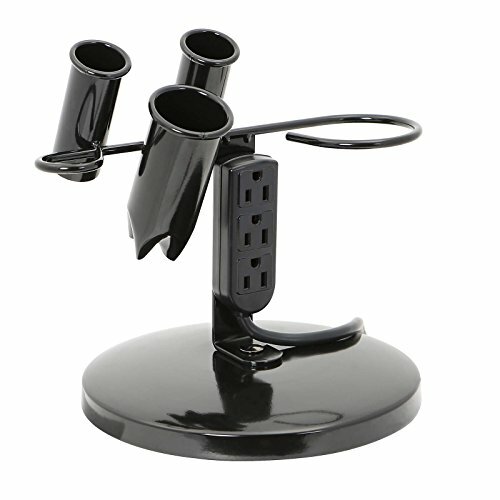 It also features 3 integrated outlets and a grounded, US standard, 3-prong power cord that is 6' long. Overall dimensions: 9-7/8" (W) x 6-3/4" (D) x 4-1/2" (H). This convenient salon appliance holder is designed to store and organize blow dryers, heat irons, straightening irons, curling irons, hot combs and other accessories, Both space saving and portable, it can be wall mounted, unhooked and moved where needed throughout your salon as a tabletop caddy, or brought to client meetings to create a professional workspace. A 2-5/8" (Dia) storage ring allows you to quickly stow and retrieve your blow dryer, including those fitted with nozzles or other attachments. It can also fit and store almost any flat or round hair iron and includes two rectangular storage compartments measuring 3-1/4" (L) x 1-1/8" (W) x 2-7/8" (D), both with a rounded area extending the width to 1-3/8". 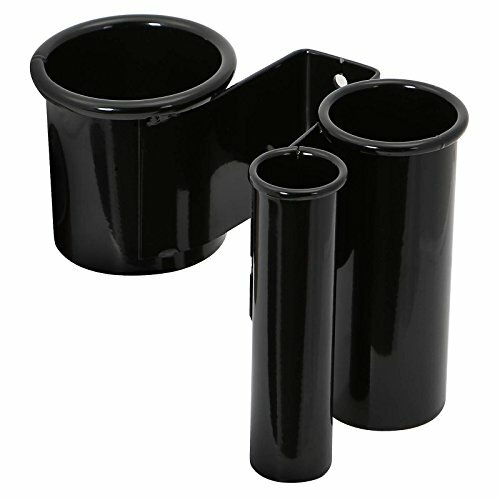 The three storage tubes each measure 1-1/4", 1-1/8", and 7/8" (Dia) x 2-7/8" (D). This appliance holder is extremely durable; constructed from high-grade steel in a heat resistant hammered finish, it is very attractive and will last for years and years. Additionally, each storage compartment is made of tough jet-black composite. Overall dimensions: 9-7/8" (W) x 6-1/2" (D) x 4-1/4" (H) with an overall weight of 1.6 pounds. The rear mounting lip measures 9-7/8" (W) x 1-1/2" (H). Two screws and anchors for wall mounting are included in the box. This convenient salon appliance holder is designed to store and organize blow dryers, heat irons, straightening irons, curling irons, hot combs and other accessories; it is both space saving and affordable. A 2-5/8" (Dia) x 3-1/8" (H) bottomless storage ring allows you to quickly stow and retrieve your blow dryer, including those fitted with nozzles or other attachments. It can also fit and store almost any flat or round hair iron and includes one bottomless storage tube measuring 1-1/4" (Dia), and a second measuring 1-7/8" (Dia); both are 5-1/8" (H). 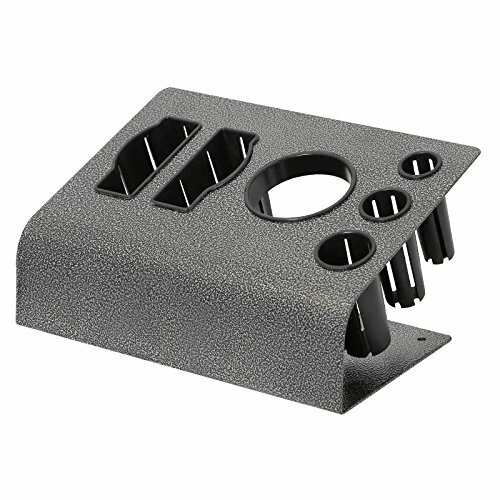 This appliance holder is also extremely durable; constructed from high-grade steel in a heat resistant, powder coat finish, it is quite attractive and will last for years and years. Overall dimensions: 7-1/8" (W) x 4-3/4" (D) x 5-1/8" (H). Two screws and anchors for wall mounting are included in the box. Get LuckIn Upgraded Handsfree Hairdryer Stand for Drying and Styling! Do you ever feel your hands tired when making hairstyle with both hands? If yes, you can get rid of it now! Just Click "Add to Cart" to Get a High Quality Hairdryer Holder! 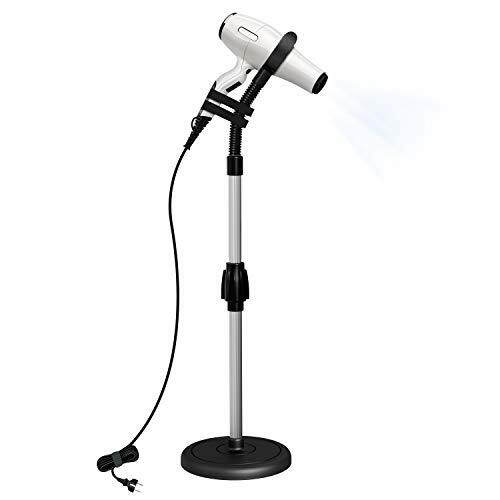 Featured with Velcro Strap, LuckIn hands-free blow dryer stand holds dryers of any sizes snugly in place, so that you can make beautiful and elegant hairstyle. This amazing styling stand holds hair dryer, leaving both hands free for styling with brush and comb. It's The Third Hand you always needed! Ideal for individuals with Disabilities, Limited Mobility, Arthritis, Carpal Tunnel, and After Surgery Care. 2.2 pounds heavy non-tipping base can keep the dryer firmly in any position. 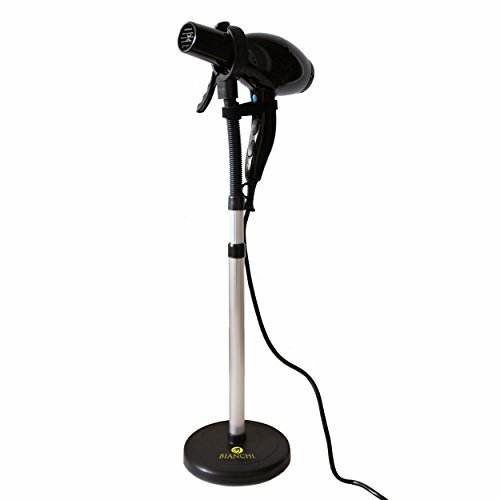 Flexible hair dryer stand neck bends to any angle, easily adjust from back to front. The base stands on countertop or ground firmly. Height adjustable for your needs. The Third Hand for You! Dryer Stand keeps your hair drying and stlying more effectively, helping to make an beautiful hairstyle. Holding Your Hairdryer Securely! 2.2 pounds base and 2pcs velcro straps makes the blower snug on stand, never falling out. Adjsuting Comfortable Height You Need! The dryer holder easily adjsuts height from 20 to 31, also fitting for kids and pets hair drying. Rotating Your Airflow at Any Angle! Hair styling stand with flexible neck allows you to adjust airflow at any angle. Easily Assemble by Yourself! You can effortlessly install hairdryer stand without any tools, uniquely thread-connecting. Ideal for styling hair by individuals after surgery care. This convenient salon appliance caddy is designed to hold and organize blow dryers, heat irons, straightening irons, curling irons, hot combs and other accessories. Both space saving and portable, it can be moved where needed throughout your salon, or brought to client meetings to create a professional workspace. It has a down-curved lip (covered in protective rubber) on the back as well as a velcro strip, allowing it to be hung from and fastened to salon carts and cabinets with indented grooves on their upper edges. It also includes an optional table clamp that can be added onto the rear of the unit with two included screws. The clamp is tightened to the underside of a table by turning a dial, and can be mounted to surfaces up to 1-3/4" thick. A 2-3/4" (Dia) bottomless storage ring allows you to quickly stow and retrieve your blow dryer, including those fitted with nozzles or other attachments. It can also fit and store almost any flat or round hair iron and includes 3 storage tubes measuring 1-3/4" (Dia) x 3-7/8" (D). 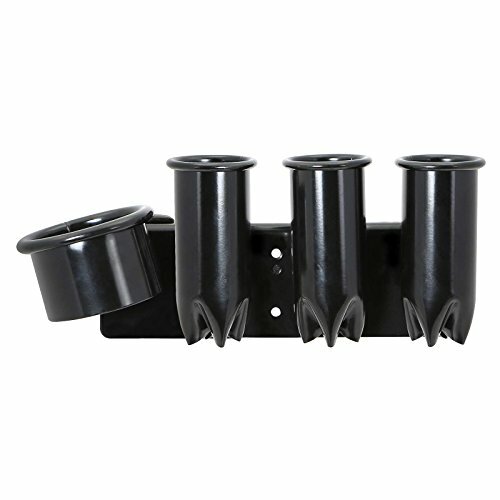 This appliance holder is extremely durable; constructed from high-grade steel in a heat resistant, black powder coat finish, it is very attractive and will last for years and years. Overall Dimensions: 11" (L) x 4" (D) x 4.5" (H). With clamp attached: 4-3/4" (D) x 5.5" (Height when fully closed) / 8.25" (Height when fully opened). The heaviest base of all models holds even the heaviest hair dryer in any awkward position - and will never fall over! Velcro straps to keep any and all hair dryers snugged tightly in place. Flexible yet strong neck that allows you to adjust your airflow in any direction. Adjustable neck height allowing you to set your hair dryer holder on any surface and get your airflow where you need it. Black & silve to make your hair dryer stand fit in perfectly to any bathroom. Instant setup! Courtesy plastic screw driver means no need to ask for your grumpy partner's toolkit to assemble your stand today. Don't wait any longer. Get your Bianchi Hair Dryer Stand today! No Falling Over! Keep your dryer safe with a heavy base to securely hold your dryer in any position. Your Dryer Fits! Velcro straps hold driers of any size snuggly in place. Airflow At Any Angle! Strong yet flexible neck allows you to effortlessly adjust your airflow in an instant. Hair Dryer Holder uses a powerful suction cup base with pressure chuck to hold it firmly in place on any smooth Desktop. 6mm-thick rubber base to strength the adsorption, can bear 5kg. 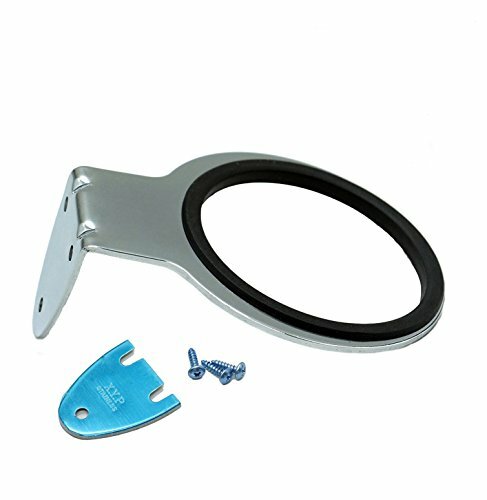 Bracket is made of iron, more durable, with rubber protection to prevent hair blower from damage. High-strength rubber buckle can fix the hair blower from falling. Flexible stand bends, can be easily adjusted to any angle you prefer. Portable styling accessory fits into a gym bag, backpack or luggage, you can travel anywhere. Note: We advice that if you don't use it for a long time, please remove it from the wall. 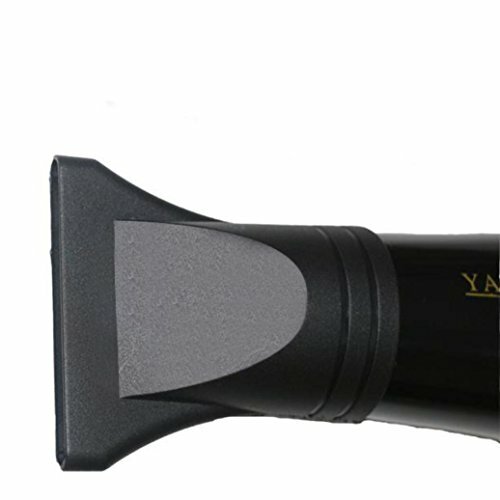 The holder is in load-bearing condition when fixed on the smooth surface, and there will be air in to the suction cup ,which will make holder fall off. 1. It suitable for SMOOTH desktop. Installation: 1. Place the bottom of the suction cup on any smooth Desktop. 2. Press the handle to easily fix the suction cup. 3. Put the hair dryer into the fixer and fix it with the belt offered. 4. Adjust up and down for perfect angling. 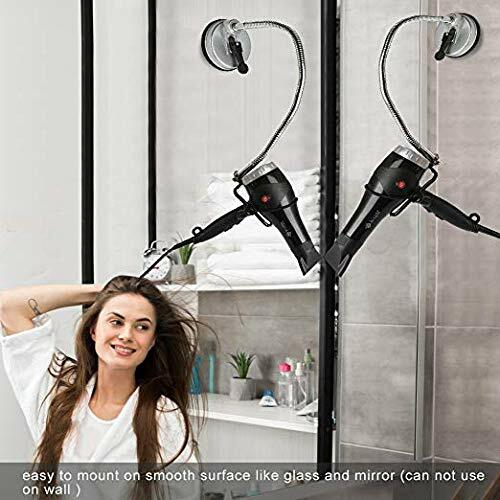 3 in 1 Dyson Hair Dryer:Work as an hair dryer stand,diffuser stand,nozzle holder,steadily hold your Dyson hair dryer with 45 degree support mode.Specially designed for Dyson hair dryer,perfectly organize your Dyson Hair Dryer accessories. Save your time: No longer forget where your diffuser or nozzle is when you need them, save much time to dry up your hair. Premium Design:Made of high quality Aluminum Alloy with refined polishing and oleophobic coating,scratch ABS head cover protects your Dyson hair dryer head from scratching and dropping,perfect performance. Various Occasions: The Premium Aluminum Alloy Docks Station comes with a ABS hair dryer head cover and two magnetic holes for diffuser and nozzles, ideal for bedroom, bathroom, living room. Saving space and keep dryer in order. Durable and firm metal constructions and buffer. Suitable for: bathroom, washroom, hair salons, etc. This convenient tabletop appliance caddy is designed to hold and organize blow dryers, heat irons, straightening irons, curling irons, hot combs and other accessories. Both space saving and portable, it can be moved where needed throughout your salon, or brought to client meetings to create a professional workspace. A 2-3/4" (Dia) ring allows you to quickly stow and retrieve your blow dryer, including those fitted with nozzles or other attachments. It can also fit and store almost any flat or round hair iron and includes one storage tube measuring 1-3/4" (Dia) x 3-7/8" (D), two tubes both 1-1/4" (Dia) x 3-1/4" (D), and a side ring 1-1/4" (Dia). 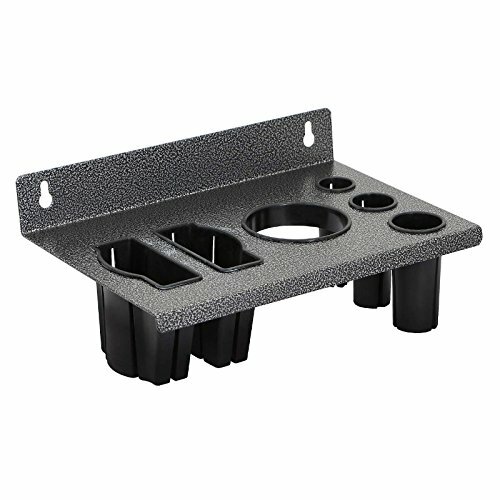 This appliance holder is extremely durable; constructed from high-grade steel in a heat resistant, black powder coat finish, it is very attractive and will last for years and years. A sturdy 8-5/8" wide base with a rubber anti-slip ring easily keeps this stand steady to support your appliances and tools. Only one wing nut needs to be fastened for quick assembly. Overall dimensions: 10" (W) x 9.5" (H). The mDesign Hair Care Basket conveniently hangs over the cabinet, creating extra storage for your hair tools. 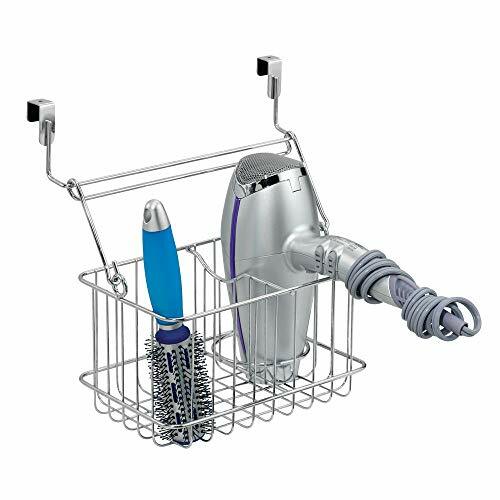 Features a removable basket with 2 sections - 1 specifically holds a hair dryer. The mDesign Over Cabinet Vanity Storage Basket is a simple, tools-free design that easily hangs over the cabinet door. Create instant access for everyday items, such as shampoo, conditioner, soap, lotion, or health and beauty products. Can also be used in the kitchen or pantry. It is light in quality and long in service life. With the plug wall hook, say goodbye to the trouble of the blower's plug line. Finally do not have to put the hairdryers on the counter and taking so much space on our counter. Saves space in the drawer and on the table. The hair dryer holder provides the extra convenience. The stand holder holds your hair dryer, freeing up an extra hand. 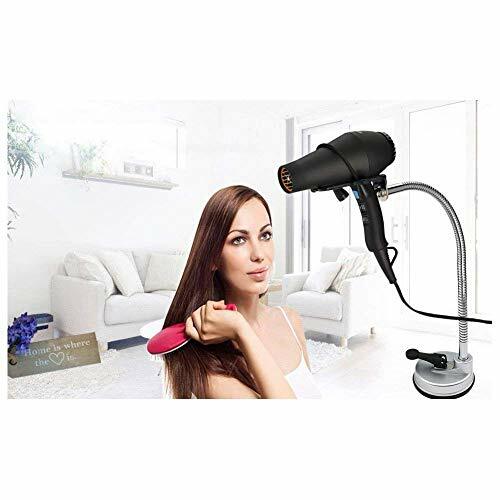 360 freely rotating brace, provides the perfect angle and height for drying hair.Hair dryer stand holder top has a strong rubber belt, can fit on any hair dryer and hold hair dryer tightly, keep safe during blowing hair and rotating rod.Hair blow dryer holder bottom has heavy duty suction cup with strong adsorption, easy to mount on any smooth desktop or wall. 1. Saving space: keep dryer in order, suitable for bathroom and washroom. 2. Hands free design, release your hands to makeup easily. 3. Easy to mount, heavy duty suction cup, super adsorption capacity, installs instantly to table top. 4. Ideal for drying nails with the help of holder. 5. Super thick rubber suction increases the adsorption capacity. 6. You can use it to comb and blow your pet's hair at the same time. 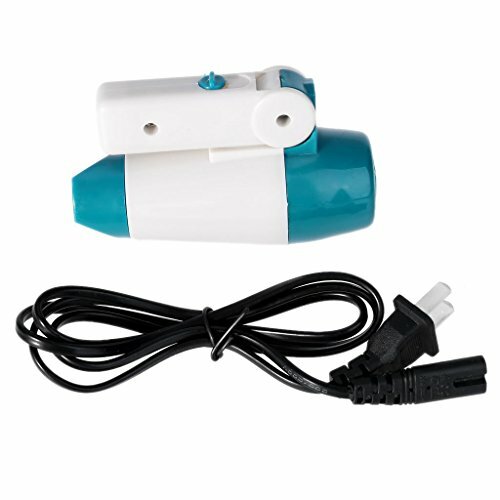 APPLICATION --Universal holder stand, hair dryer bracket own a strong rubber band, which can be fitted to any hair dryer. Strong yet flexible neck allows you to effortlessly adjust your airflow in an instant. GOOD PERFORMANCE --Lightweight portability for travel, let you easily make a satisfactory hairstyle.Keep you free up one hand when drying, and helps you styling an elegant hairstyle. FEATURE --Allows you to direct air where needed. A geat helper for you to adjust the angle of airflow, better new life. This amazing styling stand holds hair dryer, leaving both hands free for styling with brush and comb. It's the third hand you always needed. Adjusts from 27-inch to 39-inch for use on the floor or counter top. Includes a Velcro strap to secure odd sized hair dryers too. Due to the difference between different monitors, the picture may not reflect the actual color of the item, Thank you!